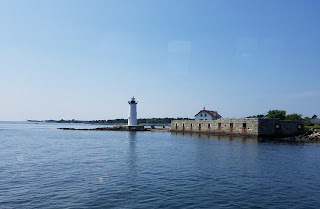 We are under way southbound in the North Atlantic, en route from Kittery Point, Maine to Rockport, Massachusetts. 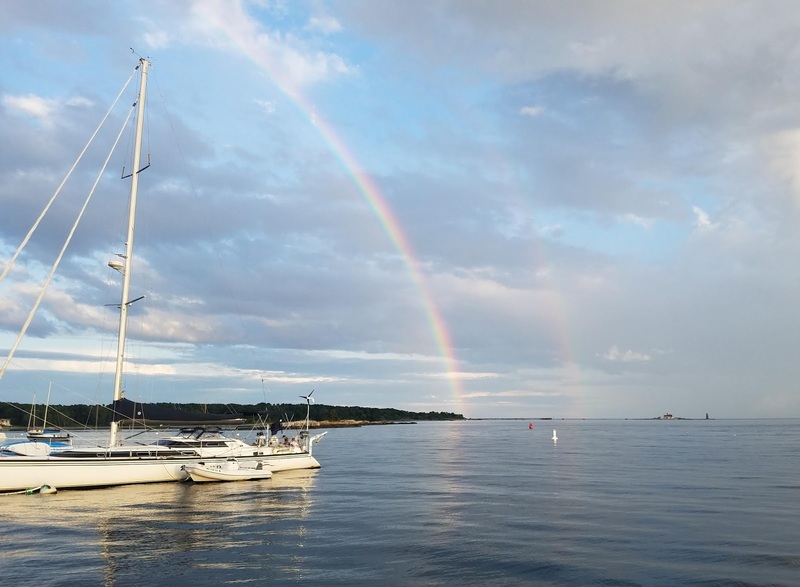 We had a very nice five nights in the Kittery/Portsmouth harbor, but with perfect passage weather we are answering the call to be heading back south. It is very nearly glass calm out here today. 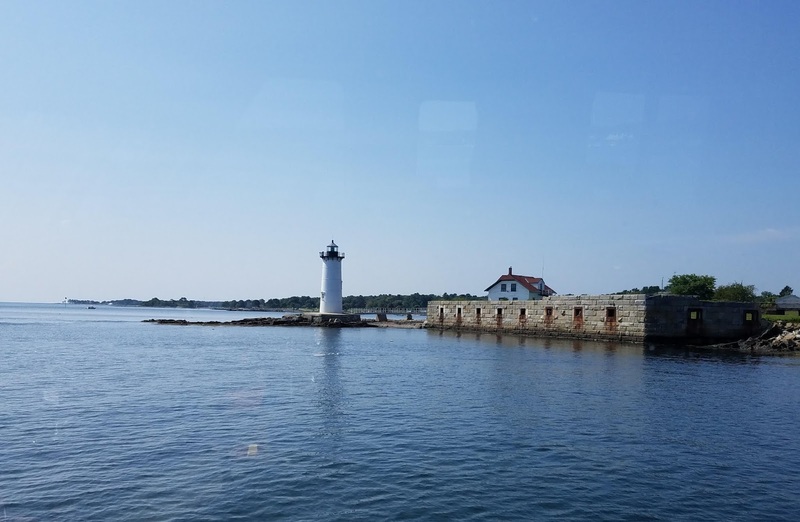 Seas had also calmed down considerably as we reached the Piscataqua River entrance Wednesday afternoon, a welcome relief after a somewhat bumpy passage. As we approached the harbor, passing the Isles of Shoals to our starboard, an LPG tanker was just weighing anchor offshore and preparing to head upriver. We need to keep 1,000 yard separation from such tankers; fortunately he finished weighing and headed upriver well ahead of us and pulling away. 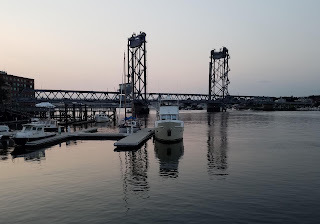 Once in the harbor we set our sights on Pepperell Cove, an anchorage in Kittery Point, Maine. As we approached, though, it appeared there was no place to anchor outside of the mooring field without running into lobster pots; reluctantly we called the harbormaster and requested a mooring. I'm sure we could have fought our way through the pots and found a spot to anchor eventually, but with the river running two knots and after a long passage, we did not want to expend any more energy on it. Ironically, the harbormaster was in Florida when he answered the phone, on some kind of family visit. He assigned us a ball and gave us directions to our spot (map). Since we were not planning on going ashore, he asked for my email address, and after some back and forth he is sending a bill for the $30 to our US mailbox. Only in Maine, where sometimes the moorings have jars attached for you to drop your money on the honor system. There is a large dinghy dock in Kittery Point, and one small restaurant/store with some nice outside tables, but we were too bushed to fiddle around launching the new dinghy to get ashore. We thought we might stop back here on our way out, but with little to offer, this morning we opted to bypass it. It was scenic, though, in the way that Maine often is, and we enjoyed our one night on a mooring. 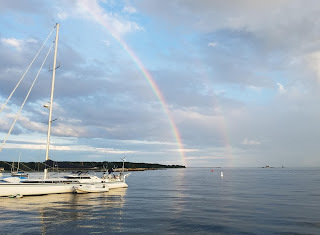 We were even rewarded with a double rainbow over the lighthouse. Kittery Point from our mooring. Whaleback Lighthouse at right. In the morning we dropped lines on the flood and whizzed upriver to Prescott Park. 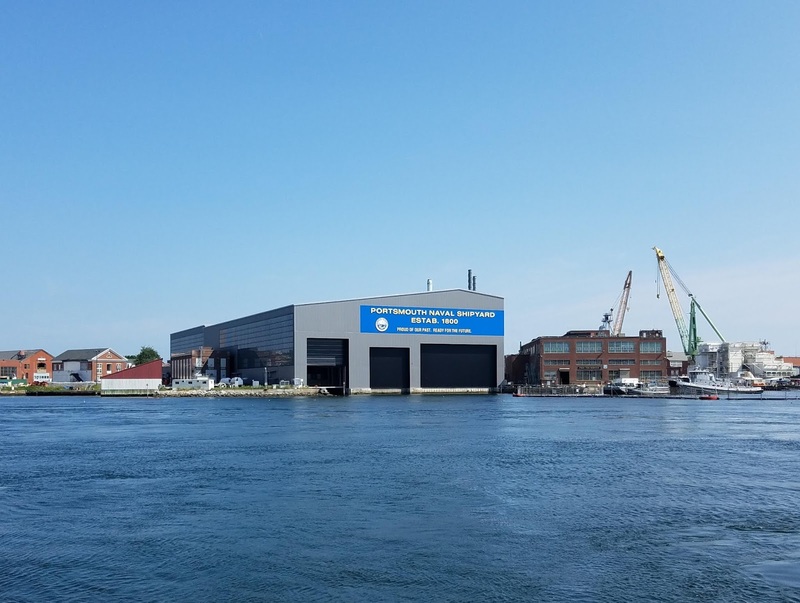 As we came around the bend abreast of the Portsmouth Naval Shipyard, four or so knots of current nearly spun us around in a swirling eddy, reminding me a bit of our trip down the lower Mississippi. Fortunately, the docks at the park are far enough off-channel that we barely had any current to negotiate at the dock. We were secured alongside by 9:30 (map), and I texted my cousins to arrange a meeting time. We took advantage of nearby trash and recycling to offload quite a bit of both from the boat, and I spent a little time investigating our surroundings there at the park. I won't bore you with the minutiae of a family visit. Suffice it to say we very much enjoyed catching up with my cousins on the last couple of days of their vacation. School started for the 14-year-old this morning, and his dad also went back to work, so Thursday and Friday were their last two weekdays off. Originally we had planned to only spend those two days, and we booked those two nights at the park, which nominally has a 72-hour stay limit. But Thursday we learned that, even though my cousin and his wife were busy all day Saturday, my uncle and my other cousin would be driving over from their homes in Saratoga and Albany for the day. And so we extended our stay another two nights via the web site. We took the fact that they accepted our reservation as permission from the dockmaster to stay beyond the 72 hours. It's about a 45 minute drive from the dock to their house in Chester, and we started the first day with them hauling us back and forth. But with the stay extended, Friday we just borrowed one of the cars to drive back and forth on our own, and I found a free city parking lot good for up to 72 hours about a half mile walk from the dock, where parking is limited to two hours. As we were driving home Friday night we were surprised to see signs a mile out of town directing visitors to a lot there with a shuttle bus, and I was worried my well-planned parking spot might be full when we arrived. We lucked out, with a few spaces left. I dropped Louise at the boat first, and spent an extra hour walking around downtown after parking. I didn't know it when planning to dock here, but downtown Portsmouth has become something of a tourist destination. There are numerous bars, clubs, and restaurants, many of them right along the riverfront. We enjoyed lunch at one of them Thursday, and we had dinner last night at another. But Friday and Saturday nights the whole town was abuzz; I was out walking around close to midnight and many restaurants and all bars were still doing a brisk business, and the clubs were just starting to heat up. Vector at Prescott Park docks. Memorial Bridge upriver of us. It was comfortable shirt-sleeve weather both evenings and I very much enjoyed walking around the vibrant downtown. Perhaps we will return some day and spend a little more time getting to know the place. It's even possible to walk across the bridge to a couple of good lobster places on Badger Island in Maine. This is the very same bridge that stopped us in our tracks in Odyssey when we came through here in 2009; since then they replaced the entire bridge with a new one that looks a lot like the old one. One evening we returned home to find outdoor movie night in full swing in the park, showing Wonder Woman. And another evening a band was playing live music on the stage. Portsmouth has a full calendar of summer events in this well-used park, and elsewhere throughout the city. My aunt, uncle, and one cousin left yesterday mid-day to return to New York, and after a quick stop at Best Buy for a new Chromebook for school, my cousins drove us back to Portsmouth where we had one final meal before saying goodbye. It was a very nice but very full visit; we've both been collapsing in bed early each evening. 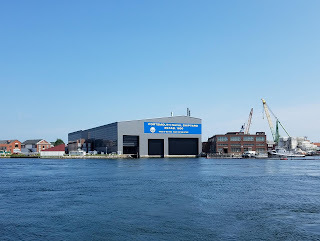 Passing Portsmouth Naval Shipyard on our way downriver. This morning we had a chance to relax a bit before the 11 am checkout time. 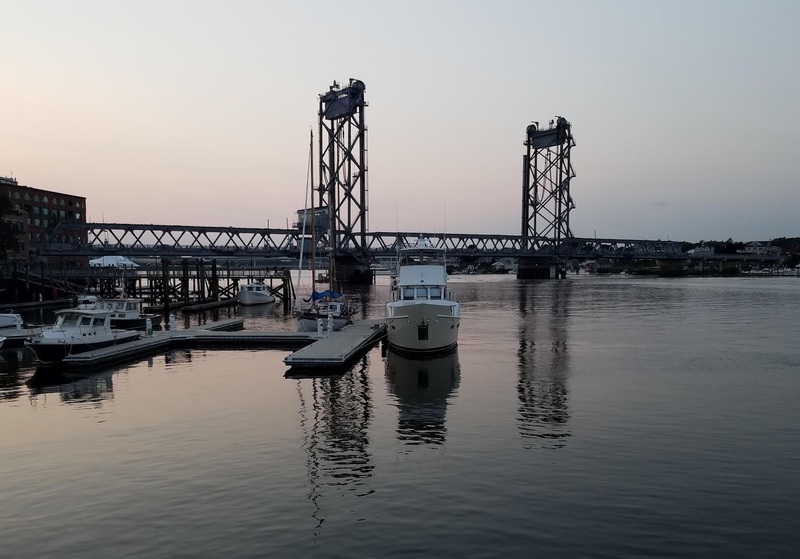 As much as I'd have like to spend perhaps another day or two anchored in the Piscataqua to visit Portsmouth and Kittery, this flat calm two-day passage window was just too good to pass up, and we dropped lines and steamed out of the river. It was slow going, with two knots against us, but once in open water we picked up speed quickly. Tonight we should be anchored just off Rockport, Massachusetts, on the north side of Cape Ann. We thought we'd try something different since we'd been to Gloucester twice already, and this stop is best only in settled weather. This will be our first chance to use the new tender since picking it up a week ago. We've been so busy with family that I've had time neither to re-position the chocks nor to load any of our gear, let alone install the plotter/sounder. We'll throw in the minimum gear to get ashore tonight, and the rest will have to wait till Boston Harbor. We should be anchored there tomorrow afternoon. Leaving New Castle Light and Fort Constitution to starboard departing the Piscataqua. We were so busy with family that we missed our 14th Nomadiversary, which came and went during the visit. It was 14 years ago Friday that we closed the door behind us on our last fixed dwelling ashore to live this nomadic life. We'll celebrate tonight at dinner ashore in Rockport. On your drive to Chester,(beautiful town)you most likely drove past my house. Hope you enjoyed your stay in NH.